2019 8+ pound Shasta Lake brown trout caught last week by Matt Coppens of Chico, Ca. Shasta Lake brown trout fishing is seeing a slower start than we’ve seen in years past, but with all the rain and snow we’ve seen this winter, I’m not surprised. Its a double edge sword in that we have had a slower bite the past few weeks, but we’ve also watched Shasta Lake nearly fill to its capacity in a very short period of time. Abundant water is key in maintaining abundant rainbow and brown trout populations of healthy trout populations in big reservoirs like Shasta Lake. We’ve had some cold water in the main body of Shasta Lake this winter season. 48 degrees has dominated the temperature reading on my fish finder for over a month now, but just over the past few days, I’ve seen a slow warming trend which should kick start our brown trout bite. I’m typically trolling big spoons and stick baits, like Optimizer Spoons and Bay Rat Lures, to attract bites from the big Shasta Lake browns. This technique also gets a lot of bites from the big rainbows as well. Since the big browns seem to orient to structure this tie of the year, you will most often times see me trolling close to the shoreline over big points are steep rock walls. These are the most productive areas right now and will be even through the summer months. I’ll catch them in open water as well, but that’s a pretty random approach to consistently finding these big trout right now. Trolling speeds will vary and so will depths of my lures during the spring brown trout bite. I catch most of my browns in the top ten feet of the water column very early and then drop down to 20-30’ feet when the sun comes up. I pay special attention to the surface conditions and will fish higher with a wind chop on the lake is present and will drop down deeper if glassy surface conditions persist with no wind. Rarely do I need to drop below 30’ feet to find the big ones this time of the year. Tolling speeds will vary, but 3.5-4.0 can be a great speed to start at. Not only are you covering a lot of shoreline very quickly, you are also triggering bites from the big aggressive brown trout. If you can’t seem to find the aggressive bites, slow things down a bit and sometimes that makes a big difference. This trout will chase a spoon or stick bait trolled fast, but sometimes they don’t want to expend the energy and need a slower presentation to trigger a bite. I have found that a good mid range speed to cover both bites is to run about 2.8 mph. Try these tactics for yourself this spring or book a trip with me and shorten your brown trout fishing learning curve. Spring is my favorite time of the year to chase big browns and when conditions are right, the brown trout fishing on Shasta Lake can be great! I’ll be fishing Shasta Lake all spring and summer so be sure to look for my fishing reports here and also on Facebook and Nor Cal Fish Reports. Come see me and lats talk fishing! This year I’ll be working at the Shimano booth #3239 in the pavilion building at this years Sacramento ISE Show. I’m one of the few guides in northern California fortunate enough to work on their Pro-Staff and consider it to be a privilege to say the least. Shimano is undeniably the industry leader in the rod and reel market and with so much competition, staying on top these days takes a lot of hard work! I do what I can to help, but in the grand scheme of things, I consider my contribution to be minor. I do my best through my guide business, website, and social media outlets to bring more customers to Shimano now and always will. I’ve invested a lot of time and money into my business and consider Shimano to be a major contributor to my success. Shimano also owns G.Loomis fishing rods, and has so since the late 90’s when they purchased the company from legendary rod builder, Gary Loomis. I was on the G.Loomis guide program when I started guiding in the early 90’s back when Gary Loomis still owned the company and felt privileged to represent his company from the earliest years of my fishing career. G.Loomis rods were industry leaders back then and still are today. G.Loomis rods are still manufactured in Woodland Washington where the company started many, many years ago. I lived in Washington for many years and passed by the G.Loomis factory many times, but never had a chance to stop in and get the factory tour. Perhaps someday I will stop in and get that long overdue experience. This will be the first year in several years Shimano is making an appearance at the ISE show in Sacramento and I believe its long overdue. Shimano’s presence at the show will be well received as there are thousands of attendees that will surely enjoy the opportunity to talk to the Shimano Pro Staffers and to get to see a good number of products Shimano has to offer the fishing world. I’m very excited to be able to talk to all of the booth visitors and look forward to sharing my Knowledge of the rods and reels I use when fishing clients on the bodies of water I work on. I’m known throughout the industry for my passion for fishing and everyone knows I am always willing to help clients and other anglers to become better fishermen in any way that I can. Working for Shimano this week is just one of the ways I can help impart some of my fishing knowledge to other anglers who I’m able to talk to at the show. My point here is that I’m looking forward to talking with you all about fishing with, and using the Shimano gear, so please feel comfortable when approaching me while you are at the show. Its why I’m going to be there and I really do look forward to talking with my old friends and making some new ones while I’m there as well. Have a great time at the show and I’ll be looking forward to talking with you all! Carr Fire and Shasta Lake fishing report. The Carr fire here in northern California has certainly turned a very promising 2018 summer fishing season into what could be described as an unexpected disappointment to say the least. Now while fishing has remained very good for the most part, we lost access to three areas we normally fish this time of the year. Numerous days had to be, or were cancelled by clients who decided to stay home in lieu of vacationing in an area of the state that was on fire or had the potential to be at any time. I can't say that I blame anyone for not wanting to bring their families into the Redding area with the Carr fire still actively burning around the areas we fish. Shasta Lake near Shasta Dam this last week. Many of my cancelled trips were back filled by anglers anxious to get in on the great action we were providing clients on Shasta Lake. In Late July and early August, Shasta Lake was seemingly untouched by the Carr fire disaster and the fishing and air quality were quite good. It wasn't until the Hirz fire up on the McCloud Arm of Shasta Lake broke out and created an enormous amount of smoke on the main body of Shasta Lake that things began to rapidly deteriorate. With news of a spreading Carr fire towards Lakehead and a raging fire near Hirz Bay, many people were warned or advised not to come up to the Shasta Lake area for their planned vacations or fishing adventures. I was upfront with conditions on the lake and many of my booked trips cancelled. For the people who didn't cancel and braved the smokey conditions on Shasta Lake, their trips really paid off on the water. Many of our clients, like Leslie from Willows, Ca. experienced exceptional days on Shasta Lake during the Carr fire. We did the best we could to push through the uncomfortable conditions on the lake and the fast action and big fish were truly a great distraction. We have had some really great days of fishing and continue do do so now, even in the hot smokey conditions. The pattern has been heavy smoke in the mornings, but some significant clearing in the afternoons when the winds shifted and pushed the smoke to the east of the main body of Shasta. This continues to provide some relief by days end and helps us forget about the heavy smoke in the morning, especially when we open the Yeti cooler to fillet the great Shasta Lake trout! Its big Rainbow season on Shasta Lake, but it will slow dramatically by October when the lake turns over for the winter. I won't break any records for the numbers of days I fish this summer and certainly won't be getting rich with my boat sitting on the trailer, but overall its already been a good year and for that I'm grateful. I really appreciate all of the support my clients have shown by re scheduling instead of cancelling, and for braving the conditions and came out to fish with me anyways. With the Carr fire now contained at 90%, it won't be long before its business as usual on all the lakes here in the Redding area. Next weeks weather forecast is showing dropping air temperatures which will undoubtedly help make our days on the water a lot more comfortable and will surely help our firefighters get these fires under control. This is just one of many great browns we have caught this summer on Shasta Lake. Summer is considered by many to be the off season for brown trout fishing, so just wait until you see what we'll be landing when we start our trophy brown trout trips in November! I still have several days of fishing on Shasta Lake this month and will be fishing both Shasta Lake for trout and the Sacramento River for King salmon in September. October will be the grand finale on the Sacramento River for King salmon before we start our trophy brown trout trips in November. If weather and water conditions hold up into fall, we should see some of our biggest fish of the year in the next few months. We're committed to bringing our clients the very best guided fishing trips, both now, and the year ahead. If you want to get in on any of the world class fishing trips we offer, please give us a call. We would love to see you holding the next big trophy fish on our Willie Boat! Shasta Lake big rainbow trout season is here! Big rainbows like the one pictured here are caught daily in August-Spetember on Shasta Lake. Well, its that time of year again and I'd say we have hit the prime time on Shasta Lake for big rainbow trout. These beauties are only available in the summer so you have to get them while they are gorging themselves on the plentiful shad schools on the system. With surface water temps hovering around 80 degrees, its important to have the equipment to go down deep to get these fish consistently. We have all the tricks of the trade dialed in and the equipment to get the job done. We do chase the big fish this time of the year so we don't always catch 30-40 fish a day, but we average at least 15-20 fish days right now and they are all big fat trout. Although this isn't considered to be the best time of the year for big browns, we certainly catch more than our share and have caught browns over 5-7 lbs regularly this summer. My thoughts are to take advantage of the big rainbows while they are here because by October when the lake cools and eventually turns over, the big adult rainbows will be looking for the spawning grounds. Not only will the big browns be dropping eggs over their spawning redds for the trout to feed on, but they themselves will be preparing for their own spawn Jan-May. The first of the big rainbows will start to show up in the lake again by May. Note the damage to the tail of this big post spawn hen (female). This what happens to these fish when the fan the gravel in the creeks and rivers when preparing their spawning beds before depositing their eggs. Although we fish Shasta Lake year round and find some great fishing most months of the year, I can assure you that now is the time to get out on Shasta and experience some of the fastest big fish action of the year, Sure, we catch big fish all the time and are always hunting trophies, but there is definitely something special about this time of the year. Many of our competitors will only fish Shasta during the summer because its so much easier to put people on good fishing. We've had a bit of bad luck this season with the wild fires in northern California and our area has been impacted directly. I can assure you though, that the good fishing has not been compromised. There have been a few smokey days on Shasta Lake so far this past few weeks, but most days see a morning breeze which clears up the area over the lake when the fishing is usually at its best. I've stayed plenty busy, but the evacuations and trip cancellations have created some openings I wouldn't normally have this time of the year. Shasta Lake is a world class fishing destination and as I bring more attention to the great fishing we see here, mote and more people will discover its bountiful fish populations and will surely take advantage of the services we provide the angling community. Sunrise on Shasta Lake is a magical time! 2018 Trinity Lake King salmon! We've started to see our summer fishing patterns develop and now its officially time to get settled into our summer fishing season. We have been and will continue to fish on Shasta, Trinity, and Whiskeytown lakes. The fish are plentiful and we're seeing some great catch rates already. The water thermoclines are developing still, but we should have some hard temperature lines develop with the really warm weather headed our way. We've already started to land some impressive fish across the board, and its only going to get better as time marches on into July-September. The King salmon in Trinity Lake are impressive, but the Kokanee up there are smaller than we saw last season. Whiskeytown has some great size to the Kokanee salmon and some in the 3 lb range have been weighted in recently. Shasta Lake is full of rainbows and brown trout again, but the salmon numbers are down a bit from years past due to light stocking the past two years. The Kings being caught are 4-5 lbs though and that should improve as summer Shad populations help them grow again this year. This should be another exceptional summer season so if your interested in getting in on this great fishing action, get in touch with me so we can get your fishing days locked down. I'm working on my July-August schedule on the lakes and will be looking at river King salmon possibilities in Sept-October. It looks like we may have some good numbers of fish in the ocean, but a (1) salmon per person limit may reduce interest in this fishery. If so, not a problem, we have nice fat trout, Kokanee and Kings (5) per person limits to pick up the slack for all of you who like to eat fish. I'll be sure to update everyone on how the in river salmon fishing shapes up by mid August. September-October is the best time to fish for river salmon in the Anderson area. Tight lines, and thank you all for your support again this year! Shasta Lake fishing report and more! Shasta Lake crested at around 12' below full pool this week and is now slowly dropping after a very successful water storage year. The spring water releases from Shasta Lake have begun and the lake is in great shape for the summer fishing season. Trout and bass fishing is excellent and we've started to see good numbers of adult rainbows back in the system after the spring spawn in the Shasta Lake tributaries. The bass are staging and with water temps rising above 63 degrees every day now, the bass will be spawning through this month. Brown trout fishing remains good, but we're now averaging two to three hook ups a day. The trout are feeding on shad so any sort of lure representing a shad has a good shot at getting bit. I've been finding most of the rainbows and browns in the 20'-30' range most frequently. Keswick Reservoir is now getting flows from Shasta lake and has kicked into action for some excellent big trout fishing opportunities. The upper section fished like a river where back trolling steelhead plugs or drifting small spoons works quite well. As the water slows its flow and enters wider/deeper sections of Keswick, trolling becomes the best method for taking trout on conventional trolling gear. Because Keswick maintains cool water temps year round, the trout are always near the surface and deep trolling isn't really required. Whiskeytown Lake is almost to full pool, but has a foot or so to go. Its fishing ok some days, but its far from the lights out Kokanee fishing we are often used to this time of the year. Its 63 degrees on the surface though and after it settles down during its fill stage, the Kokanee fishing should really pick up. I expect great fishing to begin around June after the thermocline in the lake develops. We're still catching fish every trip, but if our hook to loss ratio is lopsided, some days fall short of limits. Right now most Kokanee are being caught around 20-25' because those Kokanee tend to be the biters. The Kokanee are still scattered, but will be schooling up as the water temps increase making them easier to catch. Trinity Lake is warming up as well, but its known for its best start in another month or so. The Kokanee and King salmon fishing will come to life when the anglers start to drop more and more line in around the Memorial Day weekend. I'm headed up next week to find some Kings so I'll have better information for the readers next week. Way to go Susie!! Great brown trout! As another point of possible point of interest, lake Britton off of hwy 89 near Cayton, is producing fast action Crappie fishing. Anglers are getting easy limits and its a great place for families to get the kids out on the water and onto some really, really good fishing! Shasta Lake brown trout fishing going strong! I've been really busy on Shasta Lake so far this year and its been an incredible tear already! We are catching big German browns every trip this winter/spring with the exception of one day during a really slow bite. browns are scaling up to 10.5 lbs, but most are averaging 5-6 lbs. Yesterdays group hooked seven browns and 5 rainbows making for a great day on the water. Side planers were the hot presentation, but we did get some bites on the downriggers as well. Optimizer spoons were our hot bait again. 15-30' seemed to be a great zone to run baits all day. Optimizer spoons are making a big splash on the western lakes! The rainbow trout fishing has been quite good as well and we've started catching some of the bigger rainbows again this past week. The smaller 14-16" trout are easy to come by and most can be caught throughout the lake. I'm trolling smaller baits for them at 2.5 mph from the surface to 35' most days. I'm mostly trolling single spoons or Arctic Fox Trolling Flies, but in some of the dirtier water adding a UV Sling Blade helps draw the trout to the spoon or fly. I expect the good fishing to continue well into spring and know this summer will be great! Another nice Shasta Lake rainbow caught on an Optimizer spoon! Rise of the Trinidad Tackle Optimizer spoon! Mark Simons with his 10.5 pound Shasta Lake German brown! Not so long ago, I had the privilege to get a call from a local tackle business owner who was looking for a local fishing guide to represent his line of fishing tackle products. Stan Kulak who is the owner of Trinidad Tackle, gave me his pitch on a number of tackle items that he thought I could use while guiding my fishing clients. I was interested in what he had to say and accepted his offer to send me some of the items he sells. He has many effective fishing products that he markets, but this article is about one of his rising stars in the fishing tackle industry, the Optimizer spoon. The Optimizer spoon has a long history in the Great Lakes area, but the previous owner of the Optimizer had stopped making the spoon and it soon became forgotten in the Great Lakes fishing scene. Stan had some knowledge of the Optimizers previous existence and its fish catching ability. Stan negotiated a deal with the owner and started to produce them for Trinidad Tackle. Stan gave me a bunch of the Optimizers during a lunch meeting and asked me to give them a try. I had just finished my 2016 salmon season and wasn't spending much time on the lakes chasing trout. Some time had passed and Stan invited me to come along on a trout fishing trip on Shasta Lake. 10.5 pound German brown trout caught with me by Mark Simons while trolling a #3 Optimizer spoon. I showed up at the Packers Bay boat launch ready and eager to go catch some fish. Stan had told me he intended to run the Optimizers all day and was going to be looking for big fish. We covered a lot of water that day and I heard a lot of story's about the big browns and rainbows that Stan had caught with the Optimizers and of course, the ones that got away. I listened and watched Stan fishing these Optimizer spoons all day. I will admit that I thought he was out of his mind and I couldn't see myself fishing with them while fishing clients. His techniques and trolling gear in his boat seemed unconventional and were quite foreign to me. Stan spent time in the Great Lakes region learning from some of the best and most successful Captains and his gear reflected his knowledge of that fishery and the techniques used there. We only caught one fish that day, a small rainbow, but I left that day with a bunch of new knowledge and a new perspective on a technique I had only seen on tv. My experience that day planted a seed in my mind and I have since spent 100's of hours both fishing and studying the Great Lakes trolling systems and techniques. You see, the charter captains back there have advanced their skill levels far beyond what I have ever imagined. After learning more and more about their approach to fishing for lake salmon and trout, it became my obsession to use what I had learned from Stan and my own time on our lakes here in northern California. Its hard to step outside of the box you are accustomed to, but sometimes it opens some new doors and suddenly you are twice as good as you used to be. Tovin Schwartz of San Diego with a big German brown caught with an Optimizer spoon. I stayed close to my roots and mostly used what I was used to in the way of tackle, but would give the Optimizers time in the water when I didn't have clients in the boat. I just hadn't gained the confidence I needed to fish them with paying customers. I spent the better part of the 2017 summer season on Shasta Lake running small spoons and other tackle quite successfully. I was enjoying one of my most productive seasons ever and some of my new knowledge was paying off in a big way. I still had the Optimizer at the ready and noticed a fellow angler who was fishing Shasta and he was coming in with some impressive catches, especially the brown trout that are somewhat difficult to find in the summer months. Mike Fisher of Cottonwood had seemingly dedicated his days on Shasta to trolling with the Optimizer spoon. I paid attention and became impressed with his ability to catch big browns and rainbows in the cool deep waters of Shasta Lake during the summer months. Yet another big German brown caught on Shasta Lake trolling an Optimizer spoon. As fall arrived and the lake turned over I had the opportunity to fish with Stan and Mike. We were chasing big browns on the McCloud arm and were fishing solely with the Optimizer spoons. Mike had spent a lot of time fishing them and had discovered some color patterns that consistently produced when he fished them. Fall is typically a slow month for fishing guides on the lakes so I took advantage of my free time and fished the Optimizer spoons. Stan and I went out one day in November and hooked seven browns before we had put in a full day on the water. That was all it took for me to buy into fishing the Optimizer spoons on most of my trips out on Shasta Lake. I still used some of my old techniques and hardware to catch some great trout during the fall/winter, but some of my biggest browns were being caught on the Optimizer. I wrote reports about fishing with Optimizers and over time anglers from all over started to talk about these seemingly new spoons and wanted to get their hands on them. The popularity of these spoons has grown to epic proportions, especially with the anglers trolling for big browns and rainbows. Stan has worked tirelessly to keep up with the demand. but its been tough. He has increased production and has streamlined some if his manufacturing tasks which will surely help him keep up with the demand. Locally these spoons can be found at Phils Propeller in Shasta Lake City or online at www.optimizerlure.com. These Optimizer spoons are the real deal, but for those of you that may have doubts, just ask Mark Simons of Redding, Ca. about the 10.5 pound German brown he caught a week ago while we were trolling a #3 blue and whits Trinidad Tackle Optimizer spoon. Shasta Lake trout fishing is very good! Matthew and Morgan with their trout stringer for the morning on Shasta Lake! Shasta Lake has been a consistent producer of trout this winter season. I've had some really good days, especially when targeting rainbow trout in the 14"-16" range. The bigger fish days are intentional and we do catch fewer fish, but the quality is exceptional right now. We're seeing a lot of browns returning to the lake after spawning and some have already filled out very nicely. Shasta Lake browns are making a move back into the main arms of the lake and we're catching them consistently. I've been trolling all over and can say most of my bigger fish are coming early and right on top. If you want to get the big browns to come up for your baits, bump up your trolling speeds in the early hours of the day. When the sun comes up and covers the lake, I slow down a bit and drop the baits down 10'-20', especially if the surface is glassed over. If its windy, its not as important to go down for the trout. This fly is a hot one for Shasta Lake rainbows and browns, and so is its equal in white. See www.trollingflies.com to order! For fun fishing and catching good numbers of rainbows, try trolling some Arctic Fox Trolling flies with action discs 0"-6" in front of them, like the one pictured above. Troll at around 2 mph and you should get bites. For you bait fishermen out there, add a piece of nightcrawler to your presentations for more bites. 5'-15' feet is a good depth to start at in the morning, but just like I said earlier, drop your presentations down when the sun comes up and covers the lake surface. If you happen to see some good fish marks on the sonar in the 20'-40' range, drop down and go after them. Those fish will bite if they like what swims by. This rig has been deadly lately. Try a Mack's Lure Smile Blade in front of the small hoochie as well as I really like them. Try different color Mack's Lure 4" dodgers, especially in the UV colors for great results. Conditions are always changing and the fish are moving around the lake following food and comfortable water temps. With that being said, if you find some good fishing spots, don't leave fish to find fish. You're better off staying in one area. Those trout are there for a reason. If they leave after you've caught a few, work the shoreline. The fish will move near shore when they get disturbed. These trout will bite a lot of presentations so if a bait isn't working, try something new. Sometimes it really pays off. I have openings in March if you'd like a first hand lesson, or if you just want to have a fun day on the lake catching trout, give me a call or send me a message to set something up! Do you want to share the pure joy of catching a fish with friends or family? We can help make that happen. The smiles on the faces of family and loved ones are priceless. I've never seen a frown on the face of someone fighting a fish to the net! Redding area lakes bite improves! Beautiful brown caught this week trolling big spoons on Shasta Lake! With spring like conditions in the Redding area, we have seen a steady weather pattern and its noticeably improved the bite on Shasta, Trinity, and Whiskeytown Lakes. Keswick Reservoir has also been producing some great rainbows and the occasional brown trout. We are still seeing a good surface bite early, but dropping down 15'-20' on our brighter days is a good move when trolling for trout, especially when light winds keep the surface flat. Rainbow trout have been destroying this fly to the point most of the material is gone, yet it is still catching fish. I continue to find success trolling a variety of presentations, but have been finding the most success with medium (2 1/2") to large (3 5/8") spoons and Arctic Fox Trolling Flies. Minnow patterns have been working great, but I'm finding bites on orange or red presentations consistently. White Arctic Fox Trolling flies (www.trollingflies.com) have been absolutely deadly on the rainbows trolled at 10'-15'. Tipping them with a small piece of nightcrawler doesn't hurt either. If I had to choose only one color to fish right now, it would be white. This great Keswick Reservoir brown trout hit a metallic gold Mag Lip plug trolled at 2.5 mph. Kokanee salmon fishing on Whiskeytown Lake is also off to a good start and I expect it to heat up with rising water temps in the lake. Water managers will fill Whiskeytown in early April. When its full and the Kokanee have time to adjust, it should provide excellent fishing through September! The fishing is good now and we're still a few months away from taking off. I fished a trip this weekend and we landed ten Kokanee and lost several more, making for a fun day on the water. We're catching some great Kokanee now we're only going to see bigger fish in the coming months as they continue to grow! Im already booking trips for our spring, summer, and fall lake fishing trips. I have plenty of open dates year round, but its best to get your trips reserved sooner than later, giving you a chance to book the most convenient days for your party. I can easily book large parties and multi day trips for your group and can even schedule days on different bodies of water seeking a variety of fish species making for an unforgettable trip for all involved. Leave a contact message on this site or give mea call to reserve your fishing trip this season. Its going to be another great year! A new year ahead for Redding area fishing. Well, its here! 2018! Most of the fishing we did last year ended up being on the three lakes, (Shasta-Trinity-Whiskeytown), located near Redding, Ca., but we fished many other areas as well. 2017 started with some excellent Striped Bass fishing in the Sacramento-San Joaquin Delta, but with a massive run due to high water in the Sacramento River system, we also found some great Striper fishing on the Feather River, where we ended our "line side" season. Mokolumne River morning trip for Stripers! By May, Whiskeytown and Trinity Lakes were producing some excellent landlocked salmon (Kokanee & King) fishing. Most days were action packed and the Kokanee were above average in size this past year making for some pretty impressive bags of fresh salmon fillets at the end of the day. Whiskeytown Lake 18" average Kokanee salmon! By July, Shasta Lake trout fishing was red hot, and we landed numerous trout on every trip which included some trophy rainbows and browns in the 5-7 lb. class. August revealed some bad news for us on the Sacramento River steelhead/trout fishery, in that we saw a major decline in the numbers of fish we were used to catching on our daily trips. We still had fun and caught 20-30 fish most days, but thats a low number compared to what we are used to. It didn't end up being a problem because the lakes were still producing some very good fishing. Shasta Lake rainbows were big and plentiful in 2017! By September, we started to see some descent numbers of Sacramento River King salmon. Catch rates were better than expected, but we saw a lot of two year old's which meant our days were yielding salmon in the 7-10 lb. range. With 5-10 fish limits on our local lakes, a lot of our clients opted for lake fishing in lieu of a cane at a few small salmon. Average size Sacramento River King salmon in 2017... Ugh! By the end of October we made a move to chase trophy class German Browns on Shasta Lake and I'm so glad we did! We missed out on a pretty good late fall salmon season, but its been very slow in recent years so it was unexpected to say the least. Fortunately our German Brown trout trips produced some great specimens to 7 lbs. and we only had one trip where we didn't land at least one big brown. The fall spawning migration for the big browns is a great way to end the year! Overall we were very pleased with how our year came together and we had some very memorable days on the waters we fished. Each and every one of our clients contributed to the season we had and I am so very grateful they chose us to fish with. We learned a lot about the areas we fish and have continued to upgrade our boat and equipment we use to get our clients into as many fish as possible. I'm looking forward to our 2018 fishing season and am especially looking forward to seeing this years clients, both new and old! Now lets go fishing! Shasta Lake brown bite still good! Well its been one heck of a month and I'm happy to report that the fishing has been very good nearly every trip. We've concentrated on bigger fish and have spent a lot time hunting for the big German Brown trout. We've landed a handful of browns in the 6-7 lb. class and have caught quite a few in the 3-5 lb. range. Overall its been a great fall/winter season and it looks like its going to continue as we head into the new year. German browns are moving up and down the Shasta Lake arms and we're catching them every trip. The rainbow trout have also shown up in the mix and I'm starting to find some bigger rainbows than I had been the past few weeks. I'm mixing up my trolling lure spread so I'll attract both browns and rainbows and it seems to be working out just fine. Trolling fast with big spoons has been good for big browns, and slowing it down and sizing down my presentations is getting more attention from the rainbows. Meet somewhere in the middle and we're catching both at the same time. We started to see some of the big rainbows this week and should continue to see them more often as they start to make their push up to their spawning grounds in early spring. I wil continue to run trips on Shasta Lake for rainbows and browns, but I've had some good days on Whiskeytown Lake for Kokanee salmon as well. With Kokanee in the 15"-16" size category now, we're in for some great fishing this summer. Its still possible to get limits of Kokanee so let me know if you'd like to get out early in the year and get some fish for the smoker! 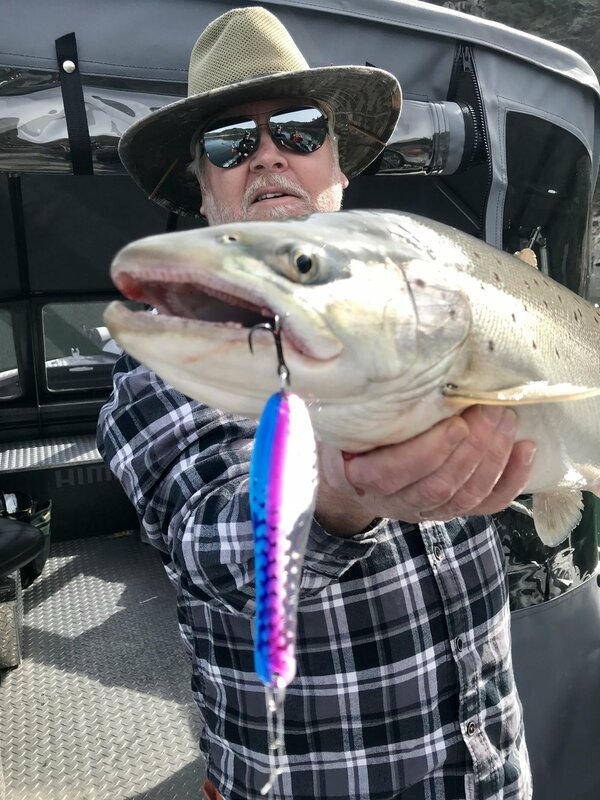 Shasta Lake winter trout bite continues. Randy with his first Shasta Lake German Brown of the morning. This brown was caught trolling 2.5 mph on the surface with a Mack's Tackle 1/2 oz. Hum Dinger spoon. Fishing for rainbow and German Brown trout on Shasta Lake continues to be productive most days. I think a lot of the browns are up the tributaries spawning, but its clear that they don't all spawn at the same time. We are catching a mix of pre spawn and post spawn browns in the McCloud arm near Hirz Bay. Trolling techniques vary, but trolling above 3.5 mph using 3"-4" spoons seem to be producing the best numbers of bigger browns. For rainbows, smaller spoons trolled at 20-2.5 mph has been productive. Almost all of our bites are coming near the surface, although running a few weight rods down 10-15' can produce strikes as well. Shasta Lake rainbow trout caught on a recent trip this past week. Most bites are coming early in the morning and late in the afternoon, with some pretty slow bite action late morning into mid day. Fishing the shorelines should be your first option, but if you are not getting bites, try fishing out in the open water and you'll sometimes find a few bites. Trout fishing on Shasta Lake is slower this time of the year so be patient and keep your lines wet. Cover lots of water and keep trying different lures. The trout will love a gold spoon one day and won't give it a second look the next. Chances are, if you put in some time on the water, you'll get into a bite at some point in the day. Tight lines! Gold and red mack's Tackle Hum Dinger 1/2 oz spoon top line trolled at 2.5 mph! This color is my top big fish producer when the fish are looking for smaller presentations.